If you’re a warm-weather and sunshine kind of person, winter can be kind of like re-living high school for three (or five) months every year: you absolutely cannot wait to be done with it while it’s happening … but as it draws to an end, you start to appreciate each experience because you know it’s ending. And so it’s March, and days are lengthening; snowdrops have popped up, and the kids went out in fleeces today – I am downright gleeful. But I’m also ticking through all the comfort foods I haven’t yet made this winter, many of which will likely be shelved until next fall as turn my focus to farmers’ markets and sunnier foods. But I’m acting like I have senioritis again – it is only March, and (as the weather report for tomorrow reminds me) there are still plenty of days to pull out some of my wintertime favorites. This rustic dish of pasta with a spicy, bacon- and onion-studded red sauce is one such dish. It would probably be good on a rainy summer night, too. But it will always be a winter dish to me, because I first made it with friends on a girls’ weekend trip to Vermont. We’d spent the day outlet shopping and snow-shoeing, and returned to make this pasta and open up a bottle (ahem, bottles) of wine. We laughed hard. Now we’re far-flung moms and moms-to-be, probably all trying to come up with an answer to the “what’s for dinner?” question. This was my answer tonight, because I want to make the most of what’s left of winter cooking opportunities, and because I was thinking of all those ladies and what they’re up to these days. And, just so you don’t think that I’m too sappy, I made it because I had everything on hand (you just might, as well – it’s that pantry-easy!) and because it’s a quick little thing that tastes absolutely great. Bring 4 quarts water to rolling boil in large stockpot or Dutch oven. Meanwhile, heat oil in large skillet over medium heat. Add bacon and cook, stirring occasionally, until crisp and browned, about 8 minutes. Transfer to a paper towel–lined plate to drain and set aside. Drain all but 2 tablespoons of bacon fat from the skillet, then add onion to skillet and sauté over medium heat until softened, about 5 minutes. Add red pepper flakes and cook another 30 seconds. Stir in tomatoes and salt to taste; simmer over medium-low heat about 10 minutes; the sauce should be slightly thickened. While sauce is simmering, add 1 1/2 teaspoons salt and pasta to the boiling water. Cook until pasta is al dente; drain and return pasta to empty pot. Add crisped bacon to the tomato sauce and adjust seasonings. Add sauce to the pasta and toss over low heat to combine. Add cheese and toss again; serve along with extra cheese, if you like. 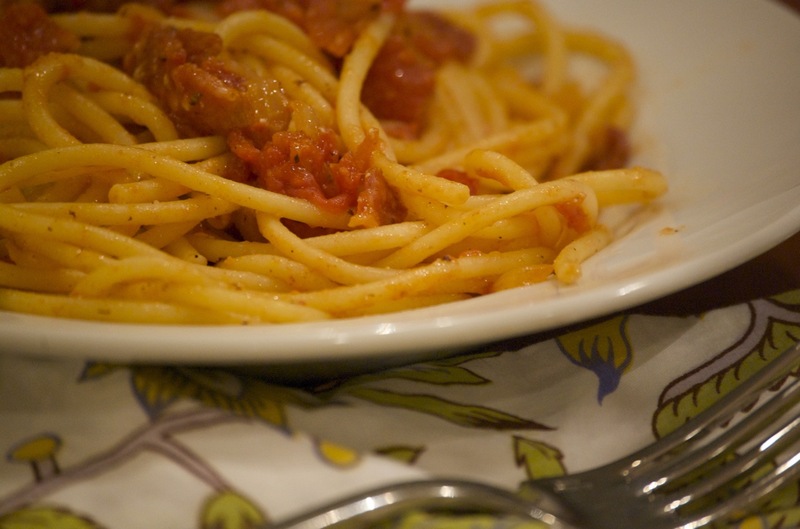 Bucatini (also known as perciatelli) looks like thick spaghetti, but is actually hollow. Keep an eye out for it, because it wears sauces well, and is really fun to eat. 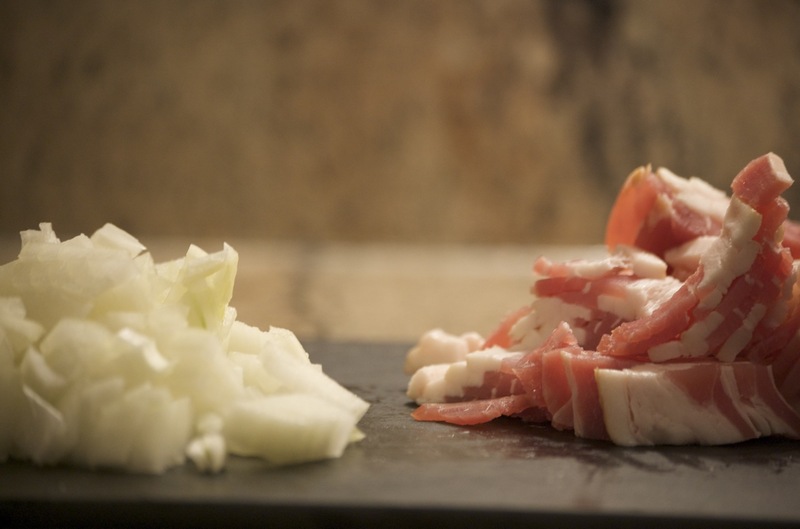 Pancetta would be more authentic than the bacon, and will cut down on the smokiness and increase the floral tones of the recipe. But only use it if you can get it cut thick – about 1/4 inch. In that case, use 6 ounces of pancetta in a 1/4 inch dice in place of the bacon. Ah, this brings back wonderful memories. I’m also a big fan of the Mark Bittman “How to Cook Everything” recipe for this dish. It’s one of our standards. This is a dish I can really get behind – I set out to cook it after a long day of work, and found it to be quick, easy and absolutely delicious. Also great that the ingredients are something you probably already have lying around. Thanks for the recommendation!